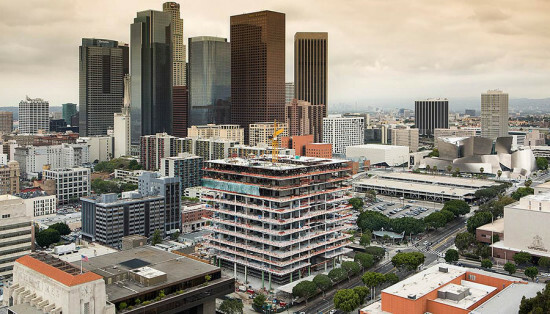 The project is being labeled as one of the nation’s safest buildings in regards to bomb threats and earthquakes due to an innovative structural engineering concept which allows a large volume of building to “float” over a stone base protected with hardened-concrete shear walls. 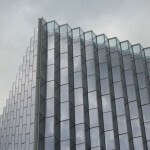 The outer 33 feet of cantilevered building is suspended from a three-dimensional steel “hat truss” system, freeing the need for columns at the perimeter and ground level. The trusses are efficiently designed through an optimization process which resulted in a material savings of over 13 percent when compared to conventional trusses. 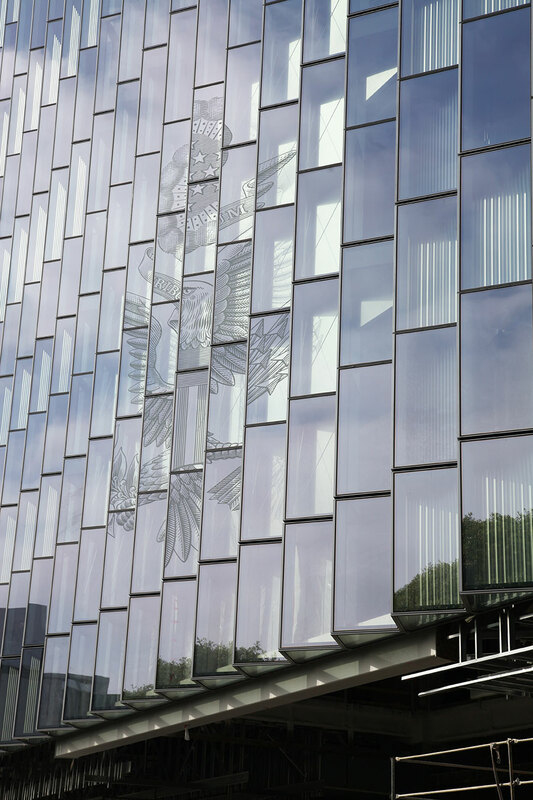 The facade is comprised of a unitized 6’ wide by 20’ tall panel, organized into a ‘pleated’ zigzagged surface. 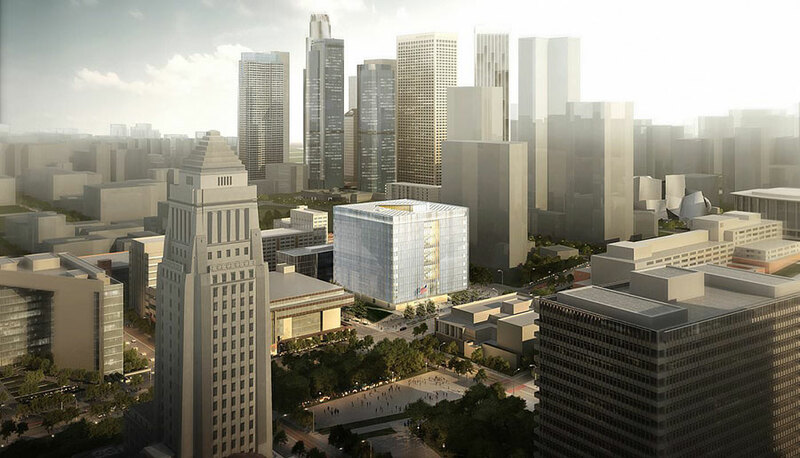 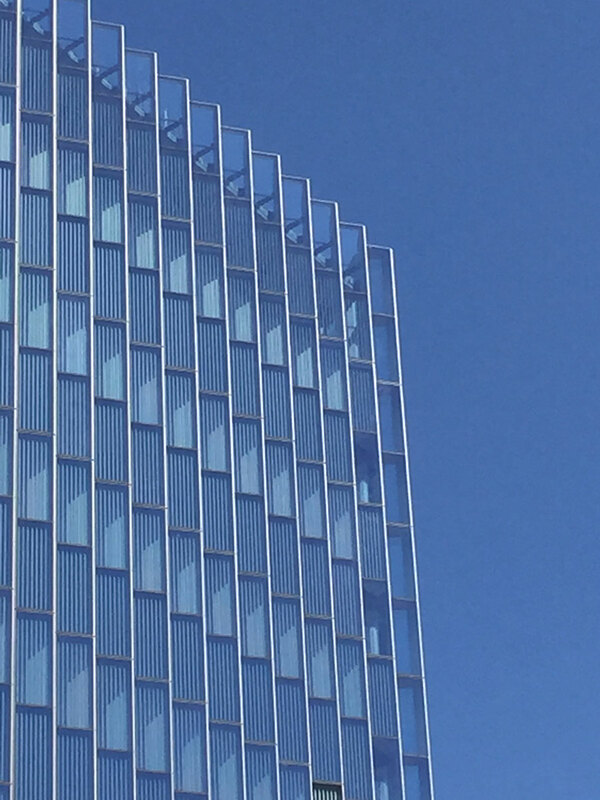 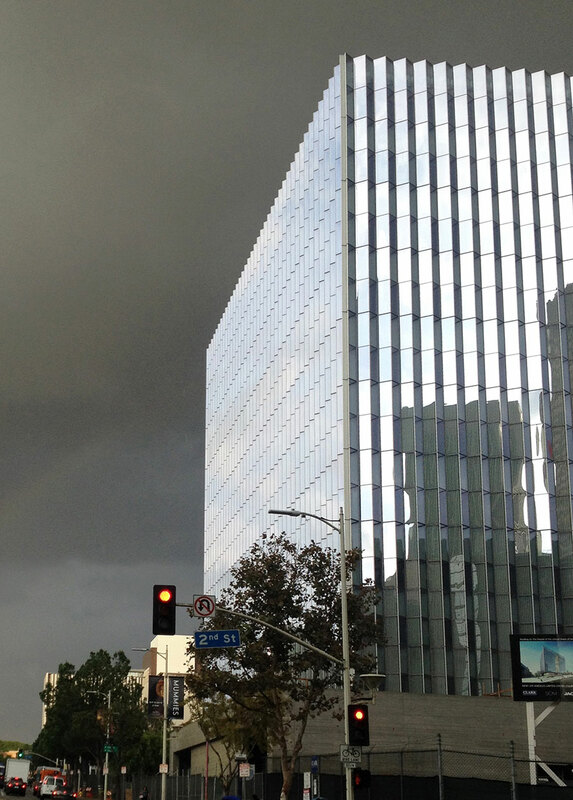 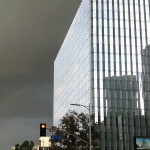 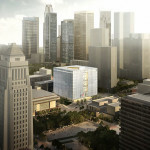 By reconciling the downtown Los Angeles street grid, which runs 38 degrees east of true north, with optimum solar angles, the facade managed to reduce solar heat gain, harvest natural daylight, and maximize views into and out of the building. 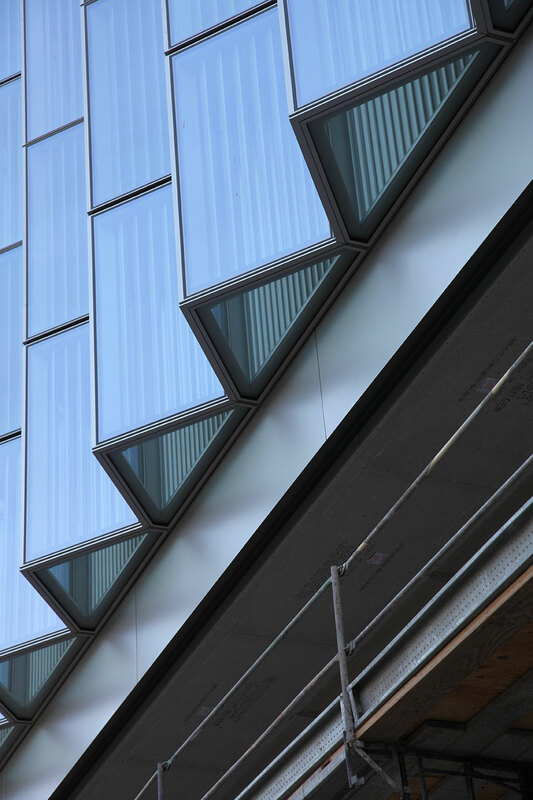 The pleating of the facade allows for a reduction in the radiant heat load of the building by 47 percent compared to a flat surface. 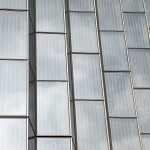 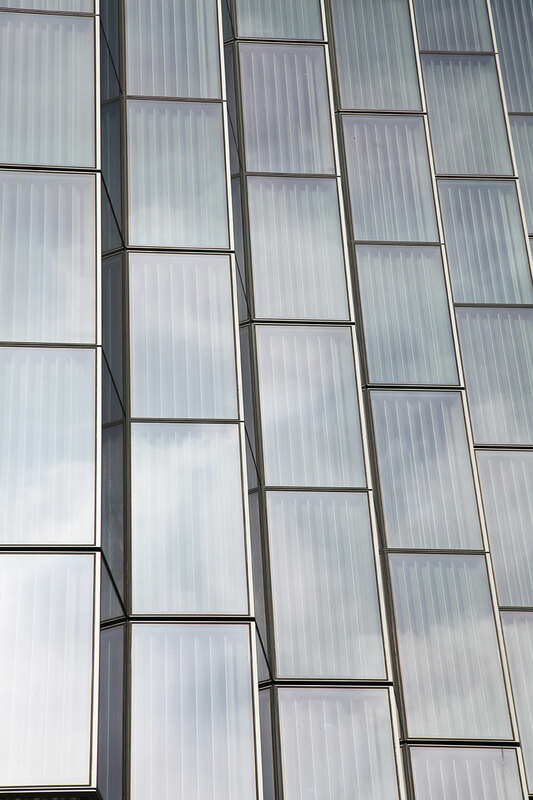 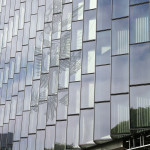 Signage to the building is applied as a ceramic frit pattern to the glass of the pleated facade. 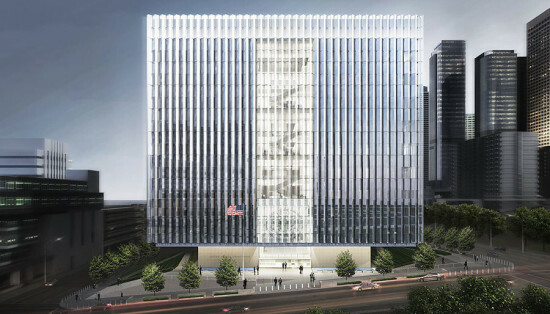 The two-dimensional graphic, the ‘Great Seal of the United States,’ is projected onto the three dimensional facade, reinforcing the civic plaza and a frontal approach to the main entrance. 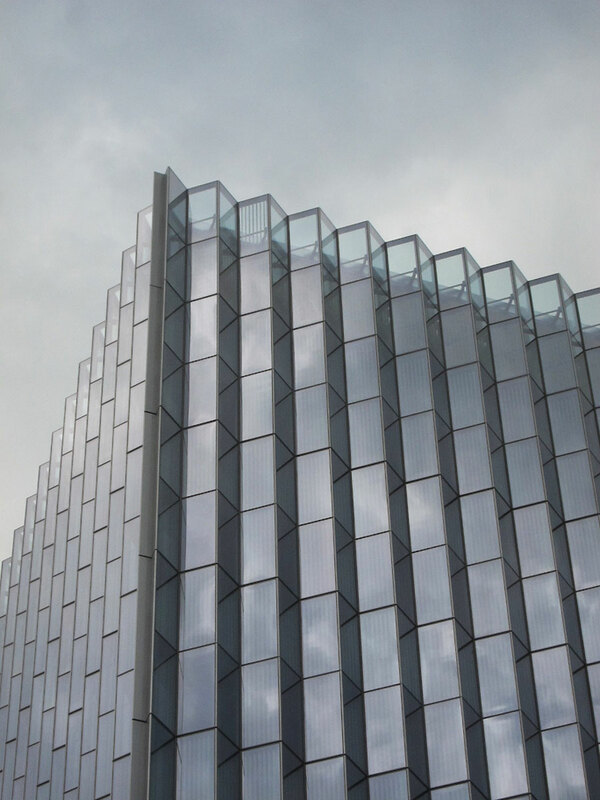 As a result of the pleating, facade panels were broken down into two types: a “hot panel” and a “cold panel” side. Additional variation was introduced through internal program requirements, such as the Broadway and Hill Street facades where courtrooms consists of three internal layers of shades help to manage daylight from both sides of the courtroom.